Join us for a beautiful Summer day's cycling around the heathland, fields and coast of the Suffolk countryside. 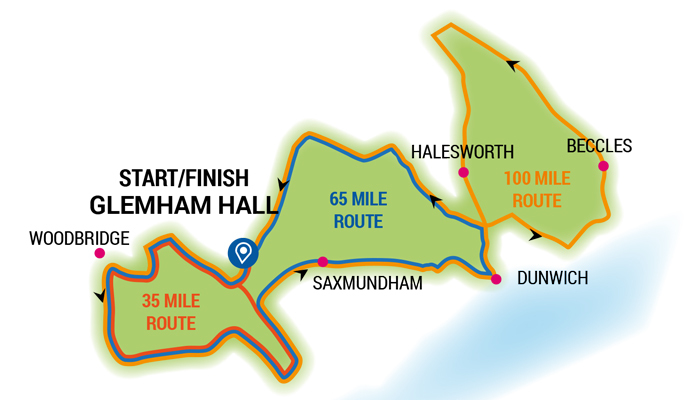 Starting and finishing at the elegant Elizabethan mansion of Glemham Hall next to A12, there’s a choice of two scenic routes of 35 & 65 miles. All routes head north through pretty countryside and villages before dividing - the short route then swings east towards Dunwich on the coast, while the longer one continues north to reach Covehithe with its curious ‘Russian Doll’ churches. 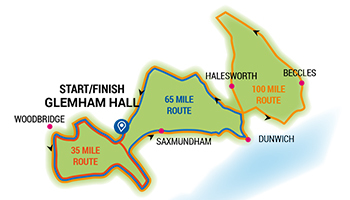 Following the coast, the long route rejoins the short route near Dunwich, crossing open heathland to finish back at Glemham Hall where you'll find massage, refreshments, live music and a bar. Med Route Short Route ELEVATION INFO (TOTAL CLIMB): 65 mile route 2280ft. / 35 mile route 1160ft. Minimum age 12 on the 35 mile and 15 on the 65 mile. 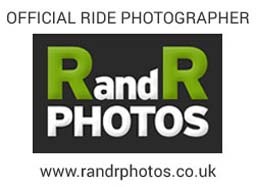 Cyclists under 16 must be accompanied by an adult over 18..